The fourth generation of Furlex is an uncompromising evolution of the worlds best selling jib furling and reefing system. Proven design blended with innovation is our way to maintain the iconic heritage of Furlex. A4302 Furling Gear & Swivels High Load Top Furler Roller furling gear for Jibs and headsails. Our rope reel allows you to wind around 100m of 10mm. Designed in stainless steel 304 L, it can be adapted to your needs. It will ensure perfect storage of your rope and a quick provision in case of emergency. 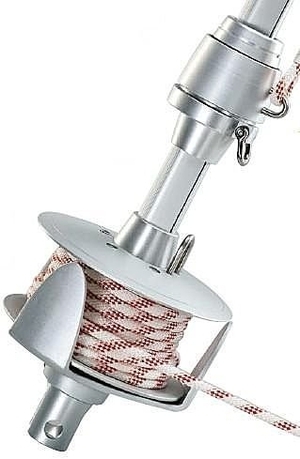 Furler recommended for sails up to 300 sq.ft. or ~ 30 m². The pin stops-sail is designed to break with a load exceeding to 1.6 ton. Roller furling for jib or mainsail permits easy adjustment of sail area as a function of wind strength. This gear is very useful when sailing short-handed. Changing or reefing a headsail that is hanked or on slides requires strenuous maneuvers on the exposed foredeck. Roller furling enables crew to reduce or add sail from the cockpit. However, it is not recommended for racing since it changes the aerodynamic characteristics of the the sail's luff, reducing performance. Roller furling consists of an anodized aluminum shaft running along the forestay (headsails), the mast or the boom (mainsail) with a drum or worm gear at its lower end to hold the furling line. Furling involves pulling on this line while progressively slacking the headsail sheet. In the case of the mainsail, the outhaul is slacked for mast furling or the halyard for boom furling. Large boats may have electric or hydraulic furling systems for sails too large for one crew member to handle. Choice of furling gear depends on the dimensions of the stays, masts and sails in question. It must be sturdy enough to handle the stresses of sailing and sail maneuvers.